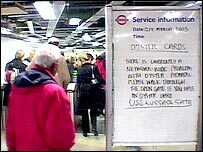 More than £50,000 is estimated to have been lost after the Oyster system for the Tube collapsed, the director of the project has said. Charles Monheim told BBC News tens of thousands of pre-pay passengers had free journeys in the morning rush hour. He blamed a software glitch that stopped the smartcard readers working from the start of the day. Ticket barriers were left open and travellers showed passes to staff. The system was restored by lunchtime. Mr Monheim said it was "the kind of thing that happens as you develop new technology". He went on: "We're not happy about it. We will be investigating what went wrong and we've been assured it won't happen again. "It's early days for the development of the system. We will be encountering these kinds of problems in the future - all systems do. "It's going through these kinds of things you learn about what needs to be corrected and hopefully you do before it gets bigger." The rechargeable plastic cards, which can be used on the Tube, trams and buses, first went on sale in 2003. Last week it was announced Oyster card users may soon be able to buy newspapers, milk and car parking with their smartcard.